These days everybody thinks they’re Christian, but Scripture tells us that most people will not make it into Heaven. From my observation most celebrities who claim to be Christian are not good role models and they are not truly Christian. Today we are going to talk about Kanye West. Even though he says he is a believer he is clearly not. He is just another tool from Satan. He reeled in Christians, by making the Jesus Walks song, now he is promoting evilness, another tactic by Satan. I know there are going to be worldly lukewarm Christians who read this and think hey, the Bible says don’t judge, which is false. These people are promoting filth. Have a problem with that. Don’t have a problem with the Christian who is trying to stop it. Ephesians 5:11 Don’t participate in the fruitless works of darkness, but instead expose them. Proverbs 12:1 Whoever loves discipline loves knowledge, but whoever hates correction is stupid. 1. He has never turned from his sins. True faith in Christ will change your life. 1 John 3:9-10 Those who have been born into God’s family do not make a practice of sinning, because God’s life is in them. So they can’t keep on sinning, because they are children of God. So now we can tell who are children of God and who are children of the devil. Anyone who does not live righteously and does not love other believers does not belong to God. 2. Kanye West blasphemes God and Christianity. Kanye West says, “I am a God.” There is only one God. You are not even close to being God. Too many people are misusing Psalm 82 not knowing what it means nor do they read the whole verse in context. He makes people think, oh so I can still have Jesus and keep my sins. 2 Peter 2:2 Many will follow their depraved conduct and will bring the way of truth into disrepute. 3. He continually mocks Jesus. In 2006 Kanye appeared on the cover of Rolling Stone as Jesus. In 2013 Kanye West brings fake Jesus out on stage. He has an album called Yeezus and He even calls himself Yeezus, which is a perversion of the name Jesus. 4. He is always cursing. It’s in his speech and in his music. 5. Kanye West has a big ego and he wants to be worshiped just like his father Satan. Sadly millions of people do worship him. Isaiah 14:12-15 “How you are fallen from heaven, O shining star, son of the morning! You have been thrown down to the earth, you who destroyed the nations of the world. For you said to yourself, I will ascend to heaven and set my throne above God’s stars. I will preside on the mountain of the gods far away in the north. I will climb to the highest heavens and be like the Most High.’ Instead, you will be brought down to the place of the dead, down to its lowest depths. Proverbs 8:13 All who fear the Lord will hate evil. Therefore, I hate pride and arrogance, corruption and perverse speech. Proverbs 18:12 Pride leads to destruction; humility leads to honor. Did you know that there is a Book of Yeezus Bible that replaces every mention of God with Kanye West? 6. Kanye West has never died to self. Matthew 16:24-25 Then Jesus told his disciples, “If anyone wants to follow me, he must deny himself, pick up his cross, and follow me continuously. Whoever wants to save his life will lose it, but whoever loses his life for my sake will find it. 7. Kanye promotes materialism and he is clearly a friend of the world. James 4:4 You people are not faithful to God! You should know that loving what the world has is the same as hating God. So anyone who wants to be friends with this evil world becomes God’s enemy. 1 John 2:15 Don’t love this evil world or the things in it. If you love the world, you do not have the love of the Father in you. 8. He promotes occultic Illuminati symbols and wears clothes with satanic baphomet symbols on them. 9. He has other gods. Kanye West has a huge expensive necklace with a symbol of the god Horus. Exodus 20:3-5 You are to have no other gods besides me. “You are not to make for yourselves an idol, or any likeness of what is in heaven above, or on earth below, or in the water under the earth. You are not to bow down to them in worship or serve them, because I, the LORD your God, am a jealous God, punishing the children for the iniquity of the parents to the third and fourth generations of those who hate me. Matthew 6:24 “You cannot serve two masters at the same time. You will hate one and love the other, or you will be loyal to one and not care about the other. You cannot serve God and Money at the same time. 10. Kanye said he sold his soul to the devil. Would a Christian ever say that? Eyes closed lyrics – I sold my soul to the devil: that’s a crappy deal Least it came with a few toys like a Happy Meal. 11. The world loves him. He made Time Magazines 100 most influential people’s list. 12. He only bears bad fruit. God is not working in his life. Matthew 7:18-20 A good tree can’t produce bad fruit; neither can a bad tree produce good fruit. Every tree that doesn’t produce good fruit is cut down and thrown into the fire. So you’ll recognize them by their fruit. 13. Kanye West doesn’t know the Jesus of the Bible. His Jesus allows Him to do and say anything. 1 John 4:1 Dear friends, stop believing every spirit. Instead, test the spirits to see whether they are from God, because many false prophets have gone out into the world. 1 Corinthians 10:31 Therefore, whether you eat or drink, or whatever you do, do everything for God’s glory. Quote from Kanye West’s close friend Jay-Z. 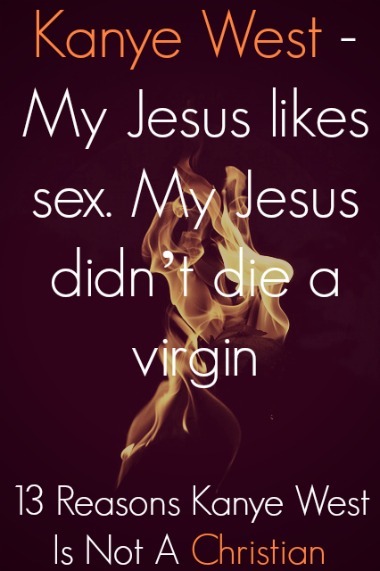 And Jesus can’t save you, life starts when the church ends. I encourage you to do a digital detox of all of Mr. West’s music on your Ipod, Phone, laptop, etc. Don’t listen to people who mock Christ and promote filth. If you’re saying to yourself well if Kanye is not a Christian, then what is? Many people think they are right with God, but they are on their way to hell. Please get right with God today. I plead with you to click this link to learn how to be saved. Your life depends on it.